With FIFA fever running on one end, tennis fans won’t sit idle as the Wimbledon 2010 championship, going to be held in the outdoor grass courts at the All England Lawn Tennis and Croquet Club in Wimbledon, London, United Kingdom. But as its for FIFA, many won’t be able to keep up with the wimbledon championship on the television, so are the gadgets to help them keep updated with everything. 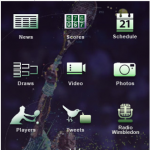 Earlier I shared the apps like FIFA apps for iPhone, blackberry, and FIFA for android, and here are a few apps for various mobiles, for keeping up with the 2010 Wimbledon tennis championship. 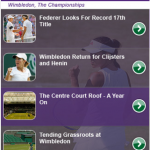 This is a free application that features the latest news from Wimbledon, Live Scores, Draws, Video Highlights, Live Audio from Radio Wimbledon. You can download the app from here. 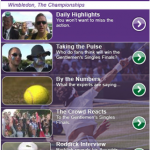 Visit m.wimbledon.org to get the latest news, scores and much more from Wimbledon. The site features the following information to keep you connected to the Championships latest news, Live Scores and Results, Draws, Schedule of Play, Player Information. 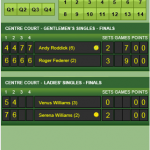 This News Feed reader provides the latest up to date news and scores on the Wimbledon Tennis 2010 and other popular tennis games. News includes score data. Download the app from here. 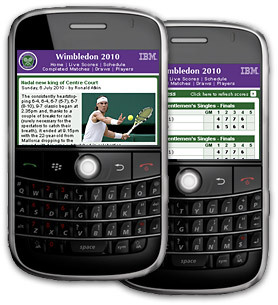 The iPhone 3GS and Android users can go to their respective app stores, and search for ‘IBM Seer’ and from here, they would be able to download another good app for wimbledon updates.